Branding is the bridge between your business and your customers. As a startup this branding is often all your customers will know about your business as you will have few reviews or figures to depend on. Therefore it is essential that this branding summarises your business effectively. Do not launch your business until you have an effective branding technique as changes to this will affect your credibility. Invest time and money into this branding and get others to give opinions on what you have done. Impartial advice from a mentor can be very useful in finding holes in your branding so you can fix them in the early stages of business. Take criticism as advice as do not be too stubborn to make changes. At the end of the day it will be you who benefits if your business is successful. Building a startup is stressful and yes, it does take over your life for a short period. However do not project this stress onto your customers. A good relationship between customers, other traders, wholesalers, lawyers, accountants and even competitors will help you in the long term and breeds business stability. Hiring the wrong people can negatively affect your reputation. It is essential you hire people purely based on their skills and personality right from day one. You must focus on building a team and as a startup it is essential each member of this team pulls their weight and fulfils the role laid out for them. It is also essential that each member of this team gets on and is flexible as often in a startup roles overlap and new tasks appear as the business grows. You need people who are prepared to work hard and get stuck in. Allow for personal development in the people you hire, for as they grow your business grows too. Check, check and check again when doing figures, financials and designing product as nothing affects reputation more than getting things wrong and getting a bad review or complaint. You can get hundreds of great reviews but the one bad one in your feedback will be the one everyone reads. People do understand there is often some early-days-problems associated with a startup but this comfort blanket for mistakes will only last so long. Focus on your reputation in your industry and get the basics right. Whilst it may be amazing if your business is really taking off and you are getting lots of customers, in fact this is what you are probably praying for, in practice growing too fast can damage your reputation. A startup must ensure the processes that you have in place are scalable and reproducible with lots of other people. You want roles in your company to be able to be filled easily so that if you get lots of customers you can easily hire someone and more business is successfully done. There is no point having a spreadsheet only you understand or a meal only you know how to cook as if your business grows you will not be able to keep up with demand and will get negative reviews, halting your growth. Lay out the things that need to get done in the business and how to do them so that if you get lots of business you can keep up with it and only improve your reputation. 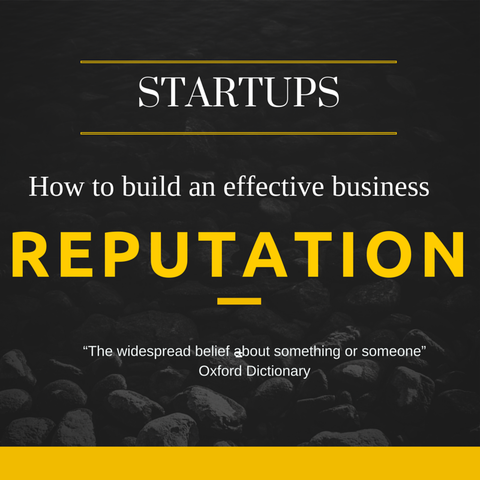 Overall your reputation is dependent on your business. Focus on your goals and revaluate your business with a mentor to ensure that your business is growing in the direction of your choosing. Don’t forget that you receive a package of mentoring and supportmentoring and support with your Startup Loan from Startup Direct. This mentoring can be essential in monitoring your branding and can help with damage control if problems occur which could affect your reputation and so is a resource we strongly recommend you utilise. For more details of this, or if you are interested in becoming a business mentor, click here.